I like dogs. I think they are cute. And I do feel sad when I see one with a muzzle and a chain around its neck and that sad, slightly tilted head and wilted eye look. But when it comes to both traditional and social media I struggle to see why the rights of dogs often gain more attention that the rights of humans. 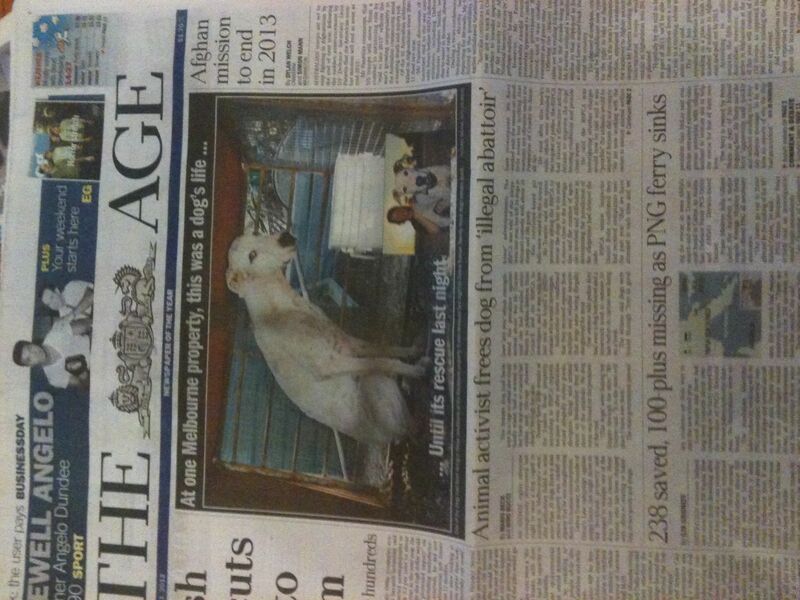 The front cover of the age on Friday showed a half page picture of a genuinely deprived and mis-treated animal, with the accompanying title ‘At one Melbourne property, this was a dog’s life… Until its rescue last night’. This article was followed by a mention of ‘100 people still missing as PNG ferry sinks’. Interesting. Not sure if I find it more disappointing that this is what sells in our society or this is how the media outlets select to prioritise. The interest and activity around the promotion of animal rights is not limited traditional media. Research done by craigsconnect at the end of last year showed that organisations promoting animal related issues gained more traction on twitter and Facebook than any other organisations – such as those associated with emergency relief, children or health. Given the real time nature of social media and the ability to immediately share first-hand experiences, the platform naturally fits with an organisation related with human issues and emergency relief organisations in particular. Regardless it is still the animals that come up trumps. Animal abuse is easier to talk about. Maybe issues related to animals gain media attention because they are emotionally engaging and also comprehensive and solvable. Even the hard hitting cases are easier for most of the general public to discuss, understand and create a fairytale ending (animal activist free’s dog from illegal abattoir). Issues related to human beings can be confronting, overwhelming and make an individual feel powerless to make an impact (100 people missing as a boat sinks off PNG). Animal rights are important. And I do like dogs. But how important should be questioned when one dog gets prioritised over 100 human beings and numerous other worldly issues. This is similar to what I mentioned in a blog post last year in regards to why is it that so much more public outrage occurred in response to the treatment of live cattle being exported to Indonesia, compared to the deporting of people to Malaysia under the Gillard government’s refugee swap scheme. Why is it that animals continue to rule the media? Perhaps it is a combination of ignorance, confrontation, and the insolvability of the human related issues pitched against the persuasive power of the puppy dog eyes. What do you think?